XEO is a Java framework and XEO Applications are deployed in a J2EE Application Server (such as JBOSS, GlashFish). 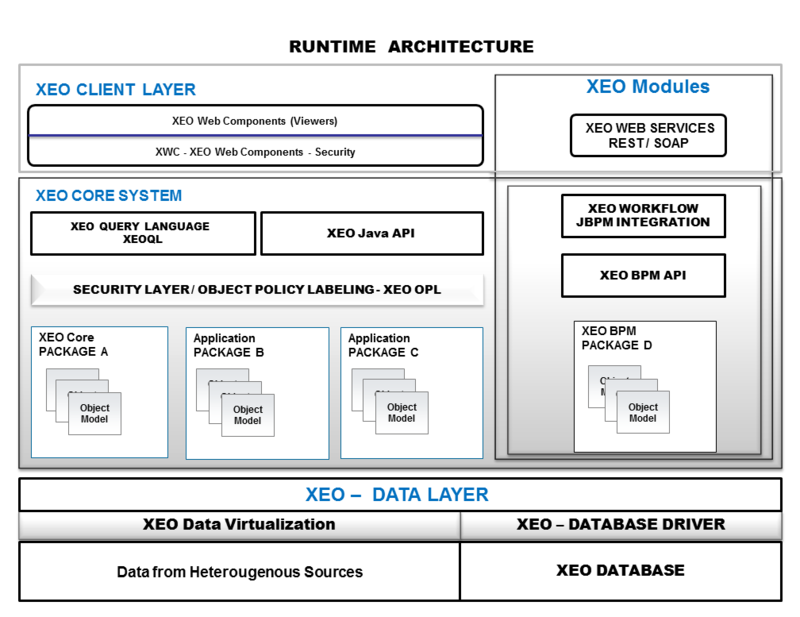 XEO's Architecture will be explained by layers (with a complete overview at the end). XEO is structured in three horizontal layers, which are set upon each other. The layers are XEO Data Layer, XEO Core System and XEO Client Controller Layer. 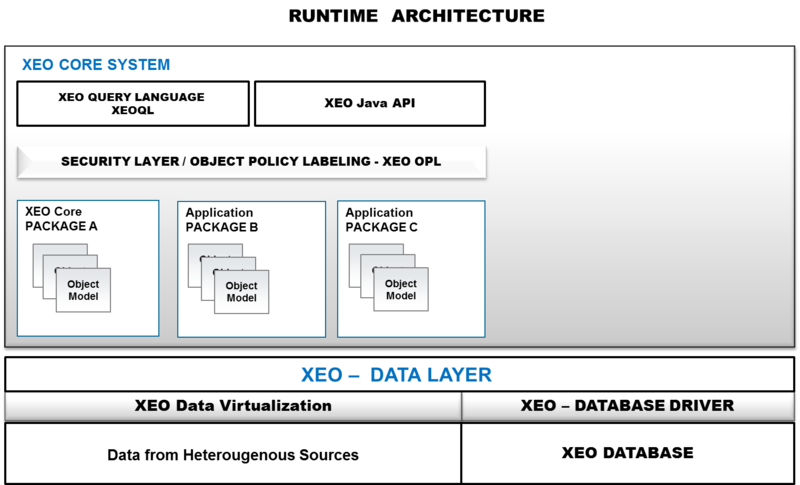 XEO's Data Layer, depicted in figure Arch.1, has two components. The Database Driver component and the component. The Database Driver is the connection to the DBMS where instances of XEO Object Models are to be saved while the Virtualization layer (at the time of writing not fully implemented) is the component which allows the use of other data sources (such as web services, XML databases, LDAP, etc..) for object instances. In the second layer, XEO Core System, you find the XEO Engine. The XEO is responsible for all the abstractions seen in the XEO Concepts section, as well as some other features, such as XEOQL (XEO Query Language), which is a SQL-esque language used in XEO to query instances of XEO Models, or the XEO Java API which is the primary method of defining custom behavior for XEO Models. The XEO Core System layer is depicted in figure Arch.2, bellow. Even in runtime, XEO Models are grouped in XEO Packages (again, merely a logical grouping). Above XEO's Core System Layer is the XEO Client Layer, which deals with the rendering of web-pages for user interaction. XEO Web Components have built-in security mechanisms, which allow to create rules where users may or may not see certain components in a given viewer (or see a viewer altogether). 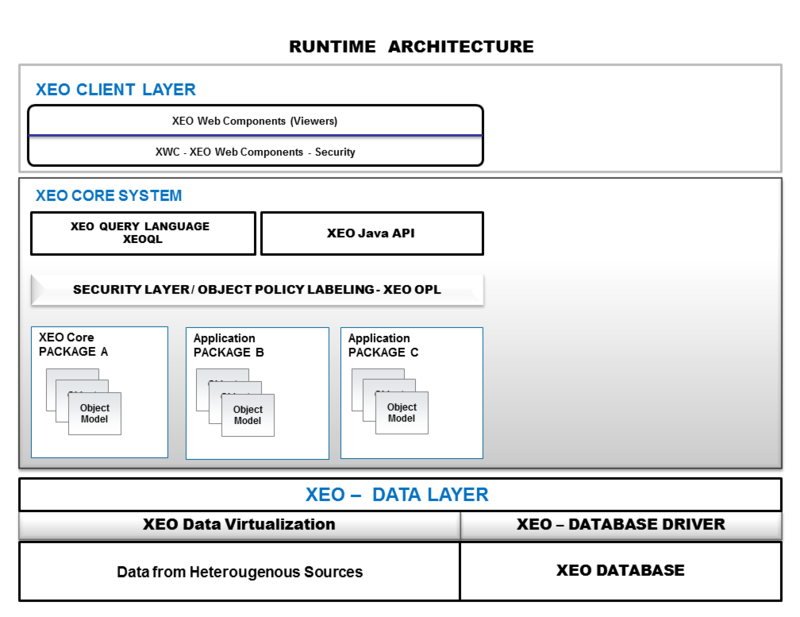 The XEO Client Controller Layer is depicted in figure Arch.3. In the next chapter we'll describe a sample application (which we'll use throughout the documentation, building an incrementally complex application), read more.